TOMMY A ROCK OPERA, THE WHO. I know that some of our number were extras in the filming of Tommy and they have their own tales to tell of the experience. Must of us know that it was the filming that caused the fire on South Parade Pier, but there were several other local venues used during the filming. Some may surprise you. During the summer of 1974 a lot of scenes from the film Tommy were filmed in and around the Portsmouth area, with many local people appearing in the film as extras. The director, Ken Russell, had used the area previously, filming scenes for The Boyfriend in 1971 starring Twiggy and Christopher Gable, at the New Theatre Royal in Guildhall Walk. Whilst the Church of Marilyn Monroe was actually St. Andrew's Church in Henderson Road, Eastney. 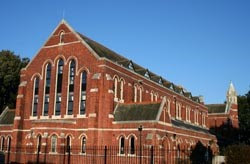 This church was built to serve the Royal Marines Eastney barracks and was dedicated at a service on 17th November 1905 by the Lord Bishop of Winchester, it was built to the design known as 'Admiralty Pattern Churches'. Following the closure of Eastney Barracks in 1991 this building has now been redeveloped into private housing. I'm sure the present residents realise the buildings religious background, but I wonder if they have seen the scenes in the film when Tommy is taken to the church by his mother Ann-Margret to be cured and where the congregation take part in a communion consuming both drugs and alcohol? I would think not! 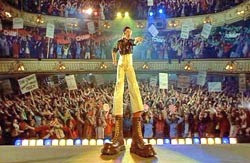 The King's Theatre in Albert Road is where the scene when Tommy battles against Elton John, wearing a massively high pair of Doc Marten boots, for supremacy as the Pinball Wizard, was filmed.Tommy of course won the competition. The boots modelled on the classic cherry red, Doc Marten, were 4ft 6½ inches high and constructed from glass fibre. Elton John kept the boots after filming as this was one of the conditions he laid down to appear in the film. He later sold them at one of his famous auctions in 1988, they were bought by a director of R Griggs, the makers of Dr. Martens. Two of the most unlikely locations for filming were in Fort Purbrook on Portsdown Hill when it was made up to look like Tommy’s Holiday Camp, it was also used for other scenes and Pounds Scrapyard. The history of the forts is well documented so here is a short history of Harry Pounds Yard. The scrapyard at Tipner was opened just after the 2nd World War and is where much of the discarded military equipment from Portsmouth Dockyard ended up. It is now mostly empty although some items can still be see them from the M27 motorway. 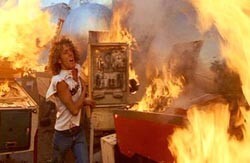 The scene filmed here was the climax to the film, scrap maritime marker buoys were spray painted silver to depict giant pinballs, Tommy navigates his way through a surreal scene of giant pinballs and collections of burning pinball machines, after his followers riot and destroy the holiday camp. 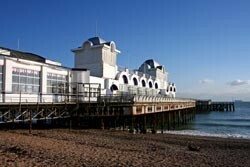 However the most famous location was when South Parade Pier was used to represent Bernie’s Holiday Camp Ballroom. As we all know fire broke out during filming when Ann-Margret and Oliver Reed, Tommy's mother and stepfather were dancing in the Gaiety Show Bar, disguised as the ballroom of the Holiday Camp. The fire resulted in serious damage to the pier estimated to be £500,000. Ken Russell's crew continued filming whilst the fire was being fought by the fire services and the fire scenes were used in other sections of the film notably the destruction of Bernies Holiday camp. The cast list of ‘Tommy’ makes interesting reading. On 22/07/1964 the number one single was A Hard Day's Night - Beatles and the number one album was Rolling Stones - The Rolling Stones. The top rated TV show was Conservative Party Political Broadcast (all channels) and the box office smash was Dr Strangelove. A pound of today's money was worth £12.24 and Liverpool were on the way to becoming the Season's Division 1 champions. The big news story of the day was Postal strike ends.